Make any meal gourmet with these classic favorites! 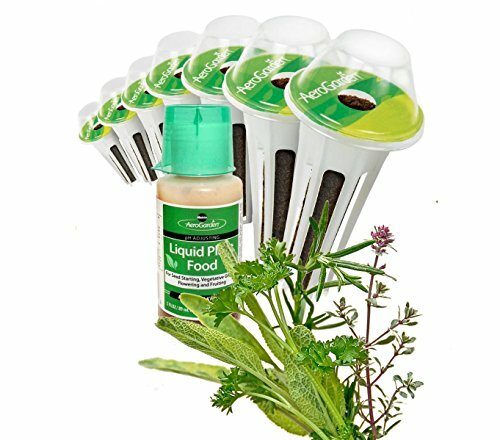 Enjoy fresh herbs all year round with this high output kit of culinary classics. Our Scarborough Fair 9-Pod Seed Kit comes with everything you need to grow and works in any of our AeroGardens! A collection that affectionately honors the lyrics from the famous Simon & Garfunkel song, this kit contains parsley, sage, rosemary and thyme. It offer lots of savory goodness and will stay productive month after month. Planting with Seed Pods is fun and easy! Just insert the pre-seeded pods in your garden, add water and the plant food. Most plants germinate within 7-14 days, are ready for harvesting in 4-6 weeks, and will keep producing continuous harvests for up to 6 months and longer. Indoor gardening can't get any tastier or simpler! Our Scarborough Fair 9-Pod Seed Kit comes with everything you need to grow and works in any of our AeroGardens! A collection that affectionately honors the lyrics from the famous Simon & Garfunkel song, this kit contains parsley, sage, rosemary and thyme.